The Marriott Fairfield Inn & Suites New York Midtown Manhattan/Penn Station hotel, an OTO Development project, has an enviable position at West 33rd Street between Eighth and Ninth avenues: it directly faces the Main Post Office, which is to be incorporated into a redeveloped Pennsylvania Station. This desirable location gave Helpern Architects the design rationale for the three-star facility, which opened in April, 2013. Because the post office building is a low-rise, landmarked structure, its exterior form must be maintained. Therefore, views over it from the hotel will remain unobstructed in perpetuity. That vista became a prominent feature of the guest rooms. Helpern chose a premium low-iron glass, which is extremely clear and sparkling, for the expansive, high-ceilinged lobby to maximize guests’ experience of the scene. For the lobby and the breakfast room, Marriott also gains a distinctive structure for a district that will inevitably attract heightened activity and redevelopment in coming years. That distinction is provided by the hotel’s noticeable street-level presence and by its rooftop, guests-only terrace and bar that have immediately proved popular. The 23-story-high structure rises as an uninterrupted tower. At ground level a dramatic 23-foot cantilevered glass marquee that is suspended by a single beam stretches out over the sidewalk. Stainless steel–sheathed columns continue the grid up the building façade and outline the dimensions of the rooftop terrace. 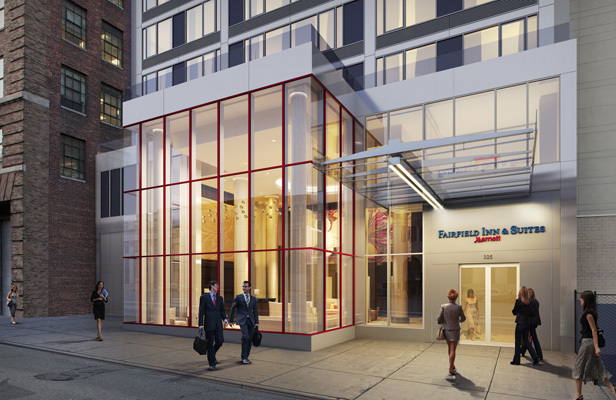 A 2½-story-high lobby – a glass cube accented with bright red mullions – projects streetward from the building wall. Red mullions also accent the window wall overlooking a garden from the breakfast area. The 107,000-square-foot property has 239 rooms, including 13 suites. It is designed to qualify for the US Green Building Council’s LEED Silver certification.